Pence Swears In Homocon Ric Grenell As Ambassador To Germany As Grenell's Partner Holds Bible [VIDEO] - Joe.My.God. 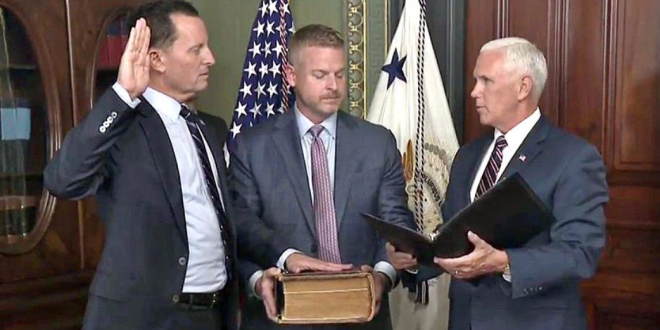 Notoriously anti-LGBT Vice President Mike Pence this afternoon swore in homocon Richard Grenell as US ambassador to Germany as Grenell’s partner held the bible. Grenell’s history of misogynistic tweets, including attacks on Rachel Maddow’s appearance, had, in part, delayed his confirmation for months. Last week he was approved by the Senate in a 56-42 vote that fell largely along party lines and is now the highest-ranking openly LGBT member of the Trump administration. During the 2012 presidential campaign, Grenell served as Mitt Romney’s foreign policy advisor for about two days before hate group spokesman Bryan Fischer launched a successful campaign for his removal. Grenell then “resigned” for the good of the campaign. Yeah.